Duets parts for Suzuki, Viola And Violin. Série composta por 3 volumes. Transcrições para Viola. Contém: Chorus from Judas Maccabaeus (G.F. Handel) * Musette, Gavotte II or the Musette from English Suite III in G Minor for Klavier, BWV 808 (J.S. Bach) * Bourrée from Sonata in F Major for Oboe and Basso Continuo, HHA IV/18, No. 8-EZ (J.S. Bach) * Minuet in G, Wo0, No. 2 (L. van Beethoven) * Gavotte (P. Martini) * Minuet No. 2, Minuet, BWV Anh. II 116 from Notebook for Anna Magdalena Bach (J.S. Bach). Viola Ensembles present duets in both viola-violin and viola-viola formats to anticipate a range of performance needs and abilities. Volumes 1 and 2 are comprised of pieces from the first and second volumes of the Suzuki Viola and Violin Schools and scored with both melody and harmony parts. Volume 3 contains some pieces from Suzuki Viola Volume 3 plus other pieces. SUZUKI - ENSEMBLES FOR VIOLA, Vol. 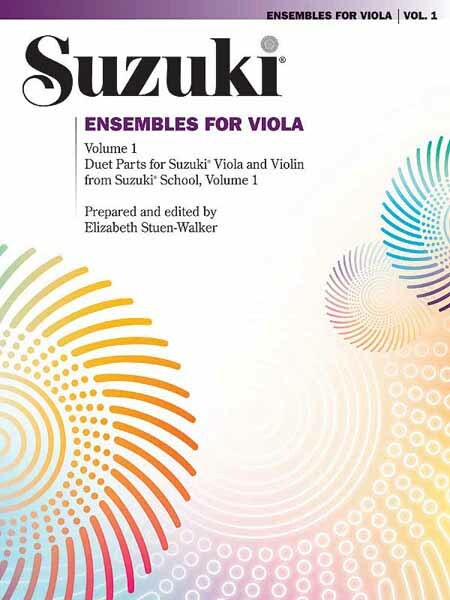 1 - Duets parts for Suzuki, Viola And Violin.